You are currently browsing the tag archive for the ‘Claude Monet’ tag. Four years on from Black Sunday and what better way to celebrate my recovery than by spending the anniversary painting a mural and participating in another ‘Sharing Day’ with Warmington and Titchmarsh Schools. This time there was a French theme, with the children coming together to experience a day filled with a variety of activities, one of which being to work with me to paint another mural. This was our third mural collaboration, having joined forces last year to produce a celebration ‘Unity’ mural and a few months ago to create a very large ‘Mad Tea Party’. Earlier in the week I had given a presentation of ‘The Story of Impressionism’ and led some drawing workshops, both in the classroom as well as en plein air. 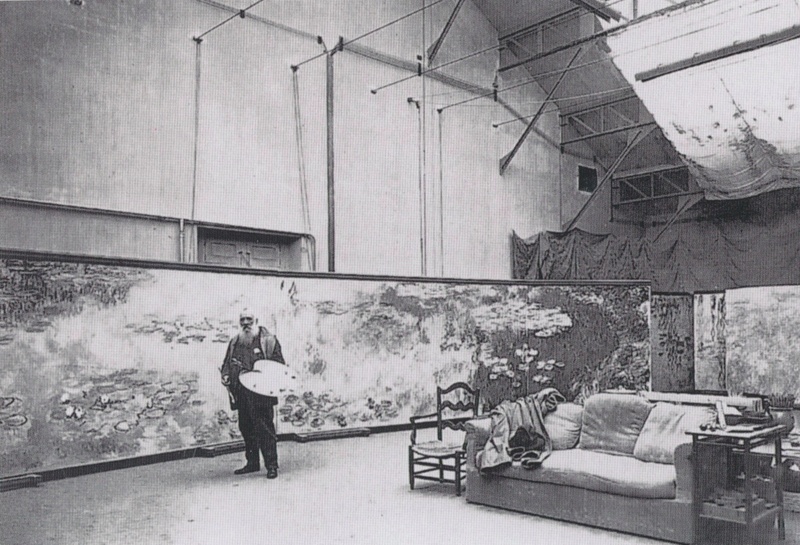 Josie Milton, Executive Head, suggested Claude Monet as the subject of our mural on this occasion, in particular the large water lily paintings produced toward the end of his life which formed the monumental Grand Decorations series now housed at the Musée de l’Orangerie in Paris. With this being the centenary year of the outbreak of the Great War the subject seemed very appropriate. Monet painted the Water Lily Pond at his garden in Giverny as well as the Weeping Willows repeatedly during the war years, employing the latter as the motif as an homage to the fallen French soldiers. After the horror of the First World War, the purpose of the Grand Decorations series was to encourage the visitor to gaze in endless contemplation. Monet wanted his work to take on a poetic dimension and provide a haven for peaceful meditation. Our mural was intended to act in a similar fashion in the school, to be seen as a meaningful and thought provoking image, but also to commemorate the anniversary of this event. The object was not to paint a slavish reproduction of a Monet painting but to enjoy the Impressionist technique of applying pure colour in an active and spontaneous manner, and to create a landscape which is constantly moving. The structure of our composition was loosely based upon ‘Le Matin aux saules’ and ‘Le Matin clair aux saules’, but includes influences of other paintings within the Grand Decorations too. It was a very enjoyable day with energetic mark making and daubs aplenty, regardless of the age group involved. Within the confined area of the corridor not all of the children in each group could work with me at the same time, so I devised a second activity to take place in the Main Hall. During the course of the day the children had not only participated with the painting of the mural located in the corridor leading to the Main Hall but had also contributed to a separate composite image produced on paper too. Monet explained that ‘Landscape is nothing but an impression, and an instantaneous one’, and this project certainly followed that example. The painting measures approx. 92″x196″ and was produced in a very short space of time, one day was spent with all the children making painterly marks and I spent another working alone to bring the painting to a conclusion. 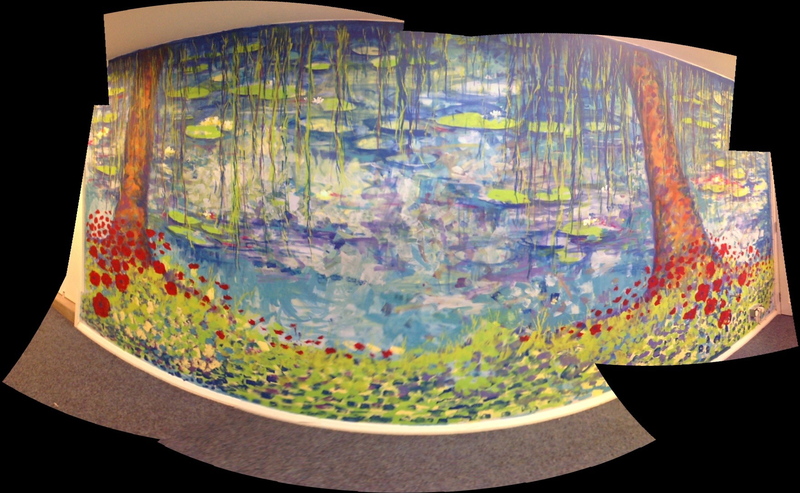 The end result is a not a copy of a Monet, it’s a painting inspired and influenced by Monet. I’d like to think that if he saw us working, that it brought a smile to his face and that upon completion he’d give our ‘Nymphéas’ a nod of approval and a thumbs up too! A couple of days working with children from year 4 at Dogsthorpe Junior School, Peterborough, to generate some ‘Landscape’ and ‘Seascape’ images following an invitation from Head Teacher Charlotte Krzanicki. The first day was spent using charcoal, the second chalk pastel. I met with three groups of 30 children each day and sessions took a similar format, I displayed a couple of my own charcoal and chalk pastel drawings in the room so that the children could identify a comparison with my regular working practise and I also worked alongside them to produce a drawing too while they made theirs. We began by making an initial investigation and exploration of working with the medium which was followed by the production of a more finished drawing as a conclusion. However, although each group received the same introduction their end piece was a different subject. In my own working practise as a painter I often produce interpretations of the work of others which I refer to as ‘Souvenirs’, a term stolen from Hercules Brabazon Brabazon, a nineteenth century artist who produced some wonderful watercolours of paintings he had seen and admired. The concluding piece for each group therefore was to produce a variation on the work of a Master, however rather than showing an illustration of a painting and making a slavish copy I described a scene and asked them to picture it in their mind before we worked together to make our interpretation of it. Working on a board which they could all see at the front of the class to produce my own version I suggested a series of stages in which the drawing could be constructed. We drew a portion of the composition, followed by another, until the sections pieced together into a picture. The children were totally oblivious of the painting they were creating or its title until it was finished, and after their teacher had searched for it on the internet it was revealed to be shown to them at the end which made for an interesting comparison. Day 1 had a ‘Landscape’ theme and the painting I selected for the first class was ‘Christina’s World‘ by Andrew Wyeth, for the second one of the many compositions of ‘Mont Sainte-Victoire‘ by Paul Cezanne and ‘Salisbury Cathedral from the Meadows‘ by John Constable for the afternoon group. The theme for Day 2 was ‘Seascape’, with the first group producing a variation of ‘Snow Storm; Steam-Boat off a Harbour’s Mouth‘ and the second ‘Peace – Burial At Sea‘, both by JMW Turner, with the afternoon group tackling ‘The Cliff, Etretat, Sunset‘ by Claude Monet. All the children made brave attempts with their image making and some successful images emerged. Unfortunately I didn’t photograph the children’s work so the examples illustrated here are the images I produced while leading each of the groups………….. Nevertheless, these sunset images after Monet were all produced by the children and are a selection from the last group of the day. Considering it was a Friday afternoon and the last session before breaking up for half term, I think they produced some pretty breathtaking drawings!